We just returned from completing the Maroon Bells Four Pass Loop and we have so many emotions. We are triumphant, tired, in serious need of a shower, and awed by nature. Our expectations were met, and then some. If you have three of four days near Aspen, this is the only activity you should do. It is beautiful, and hard, and makes you feel small in all the right ways. 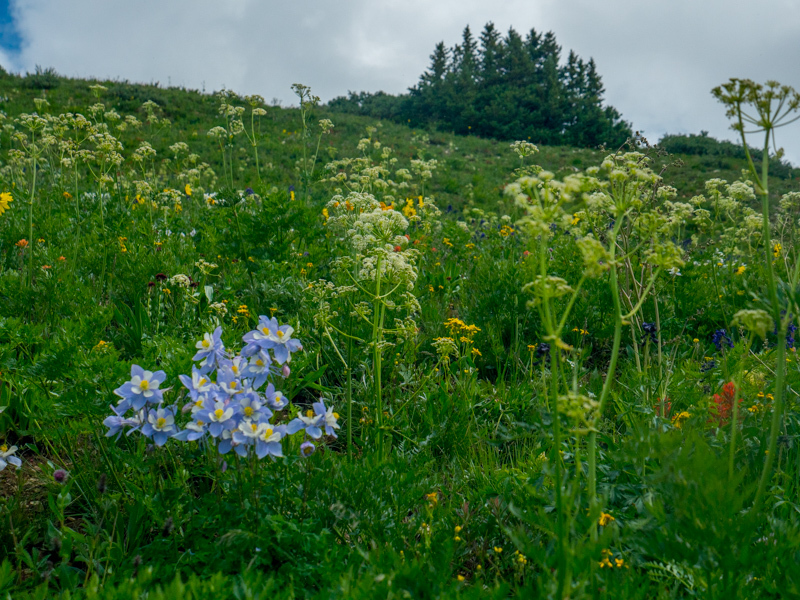 If we could name this hike, it would be “Wildflower Extravaganza: An Ode to the Exhausted Flower Hunter.” The wildflowers on this hike were ON FIRE. Not literally, because of the intense fire ban in the area, but I’ve heard the young kids saying that, and I really feel like it applies here. 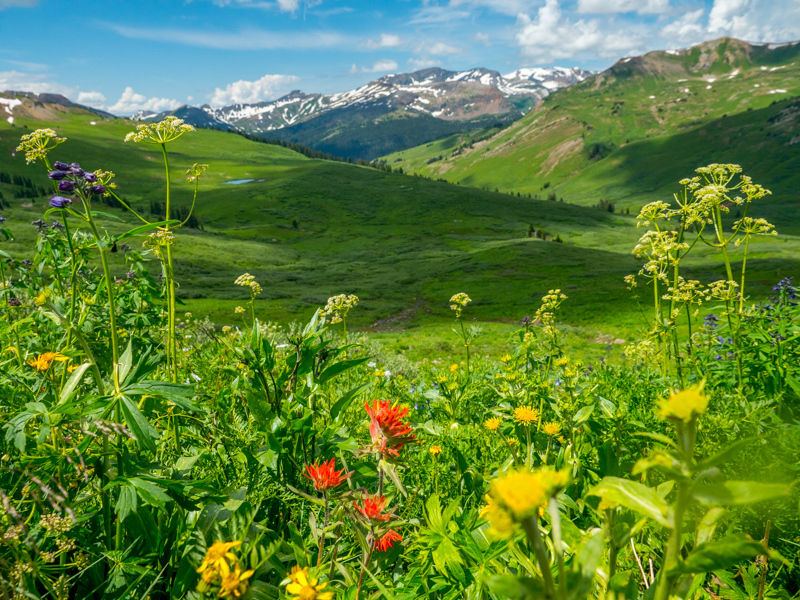 If you are in the business of wildflower viewing, which you should be, please see our list of great places in the state of Colorado (and then some) to see these beauties this summer. If you read any of the first paragraph, then reading this one is unnecessary. The wildflowers here are remarkable and saying they’re in “peak season” is an understatement. This is the type of wildflower explosion where you can’t stop saying, “These wildflowers! 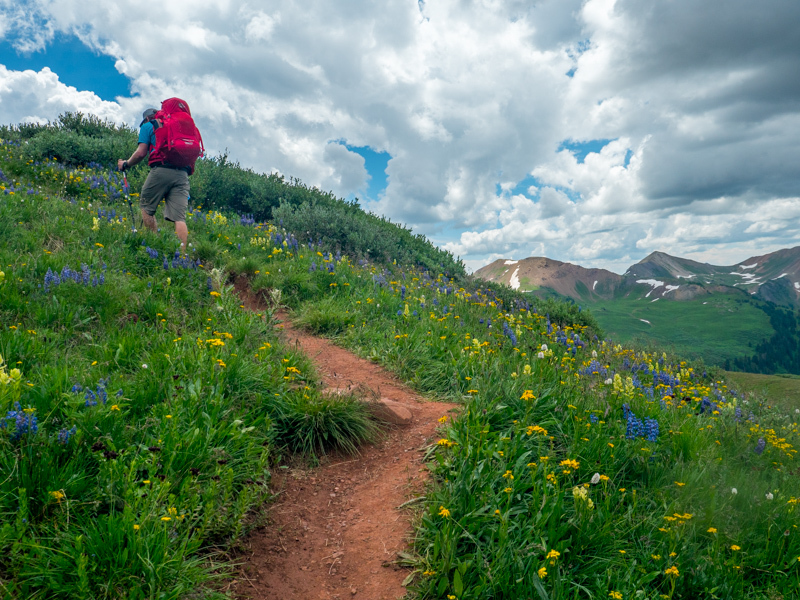 How are they so incredible!” If the Four Pass Loop seems daunting (which it should) then try a day hike up to West Maroon Pass from Maroon Snowmass Trailhead, or a through hike from Crested Butte (wildflower capital of Colorado) into Aspen going over the same pass. The flowers are just as incredible, and your legs will thank you later. If you want to stick closer to the front range, try out this park 20 miles south of Denver. 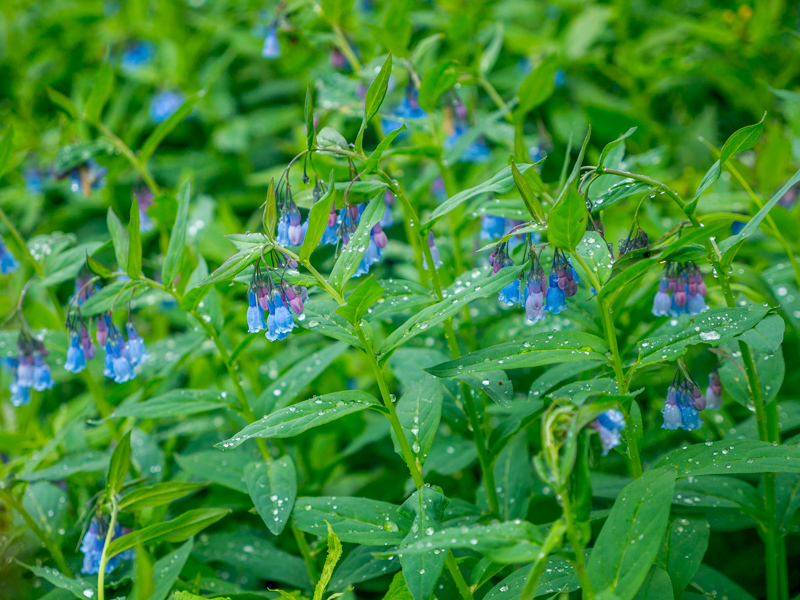 With 300 million-year-old sandstone, you’ve got the perfect backdrop for some beautiful wildflower photos. As the plains rise into the Rocky Mountains, the environment creates an ideal situation for wildflowers to bloom. While peak wildflower season is touted to be around July 4th, there are still plenty of beauties to be spotted in this super accessible park. Forget walking! 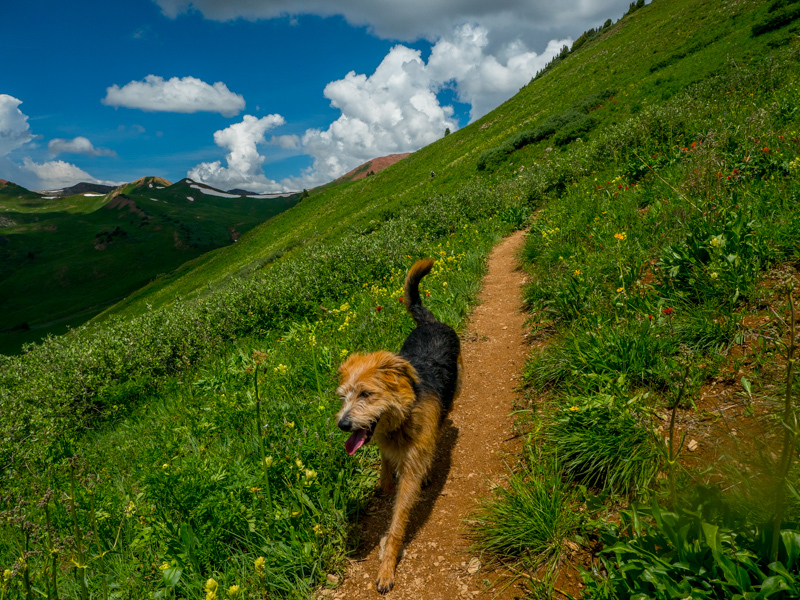 Grab your bestie with the awesome 4-wheel drive, high clearance, vehicle and make a day of this 63-mile loop through the San Juan Mountains. This loop is only open a few month of the year, and they just happen to coincide with wildflower season. Plan on cruising two mountain passes above 12,000 feet and setting eyes on five of Colorado’s 14ers. 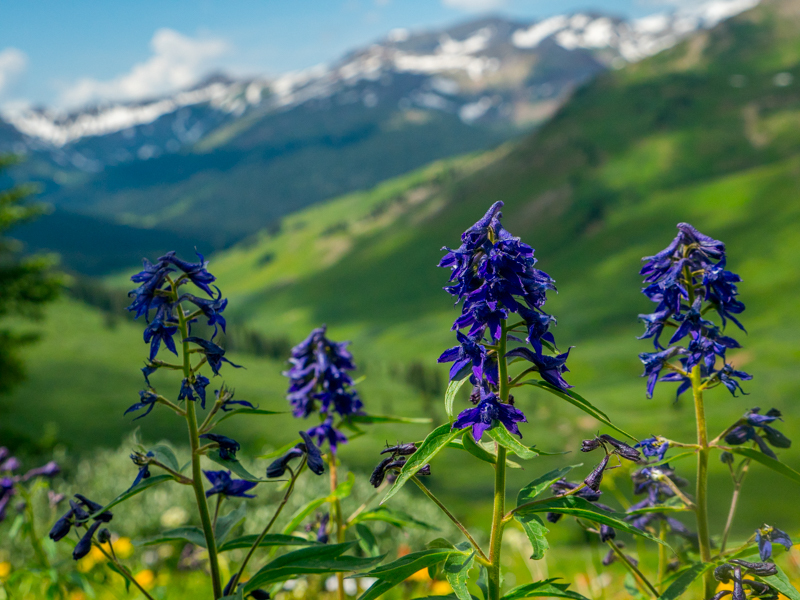 You’ll rock hop through Ouray, Silverton, and Lake City, make sure to end your wildflower viewing with a dip in the Ouray hot springs, seeing so many beautiful things in one day makes you tired. This strenuous hike from Hessie Trailhead teases you with some extra mileage under treeline, but once it crests above those pesky saplings, you’re in for a treat. Wildflowers with alpine lake backdrops a plenty. 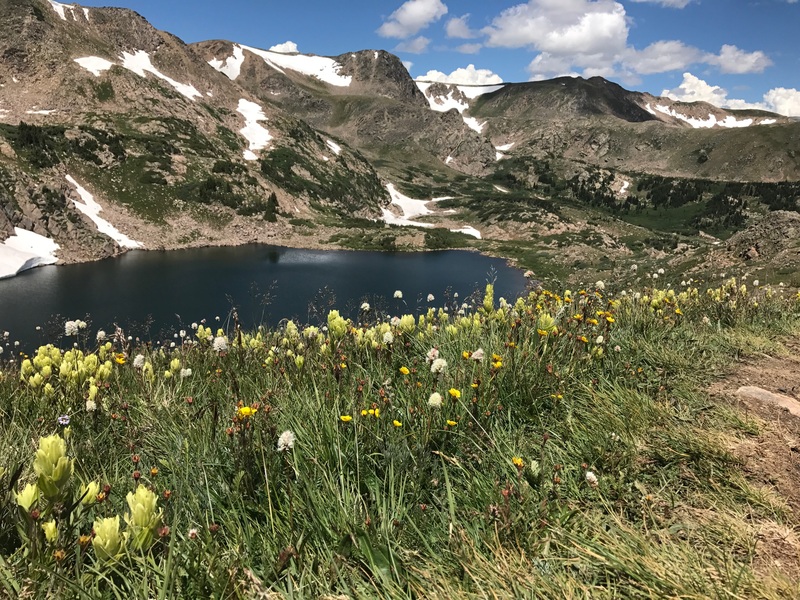 Shelves of meadows with wildflowers reaching toward the sun are the appetizer to King Lake’s bowl of beauty. If you make it up there, prepare for nature to be putting on its fanciest outfit. If you’re over on the East Coast, do everything you can to make it to the Great Smoky Mountains National Park to see the wild flowers in action. It is literally a “world renowned preserve for wildflower diversity.” There are 1,500 different kinds of flowering plants in the park. I can’t even name ten different wildflowers; this is the ultimate show of diversity. The park has a whole cacophony of blooms happening from spring through fall, so go at any time and soak in the wildflower goodness. If you have any of your own suggestions, please comment here! Fellow wildflower hunters will thank you. 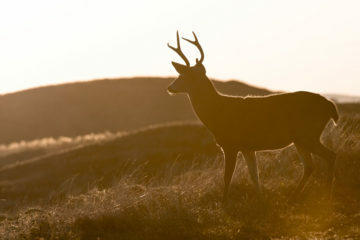 Now get out there and get some pictures your friends will be jealous of. 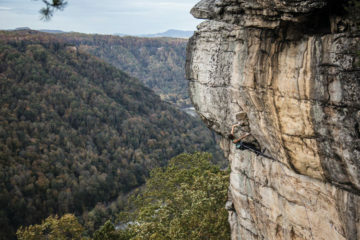 Next ArticleThe August Issue of Blue Ridge Outdoors is Live!